This is about the easiest thing in the world to make and the prettiest. I like a mix of peppers but use any type you like. 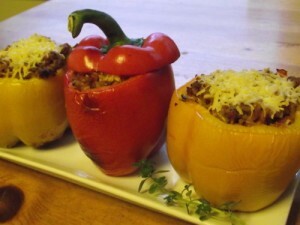 If you’re making these as appetizers use the mini peppers as these babies are more knife & fork style. Carefully cut the tops off of the peppers (so you can use them as lids) De-seed the peppers and pull out as much of the white vein parts as you can without destroying the shape. Now turn the pepper upside down and slice the bottom a little to create a flat surface for standing. You don’t want to create a hole, just a flatter area so the peppers don’t fall over. Take the sausage out of it’s casing and brown it in a large skillet. Once cooked drain off excess grease and add garlic and onions. Saute until transparent and then add all remaining ingredients but only HALF of grated cheese and let simmer gently for a few minutes while you broil the peppers. Place the hollowed peppers and lids on a baking sheet under broil until slightly charred on all sides. Remove carefully from the oven as the skins will be loose and slippery. Fill with sausage mixture, top with remaining cheese and put back under the broiler just until cheese browns slightly.